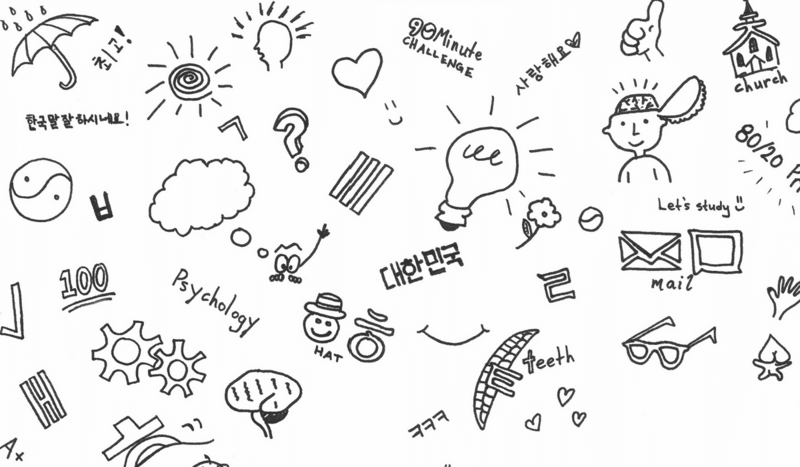 If you’re planning a trip to Seoul, the list of things to be excited about is a long one. Whether you’re most excited about meeting new people, learning more about Korean art and culture, or getting your groove on in a Seoul karaoke bar, you have the trip of a lifetime ahead of you! Arguably one of the best parts of visiting Seoul is the restaurant scene. During your trip, you are going to experience some dishes that are unlike anything you’ve ever tasted, even if you’re a fan of Korean food. Don’t worry — with all the walking around the city you’ll be doing, you can enjoy ordering all the amazing food that Seoul restaurants have to offer with minimal guilt! 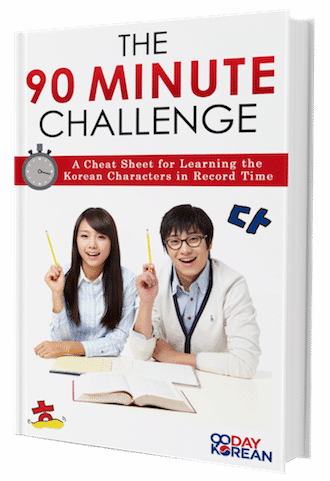 Ordering at Korean restaurants gets much easier the more familiar you are with Hangul, the Korean alphabet — check out our 90 Minute Challenge and see for yourself how easy it is to start learning! 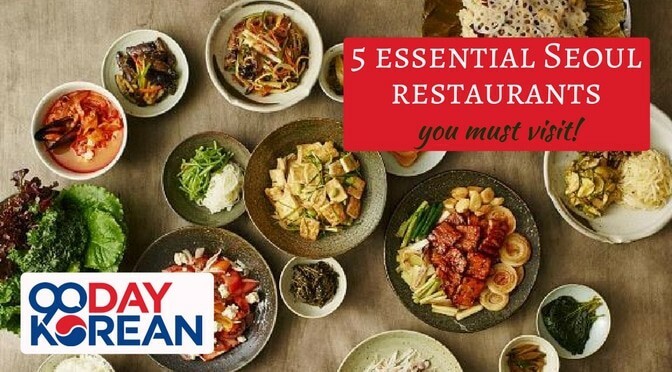 Sit down, buckle up, and get ready for our top five restaurant picks that are essential to getting the most out of your time in Seoul. You should probably pack a couple of pairs of pants with an elastic waist, just to be safe! How do you feel about dumplings? We’re assuming your answer was positive, because dumplings seem to be a universal favorite no matter who you are! 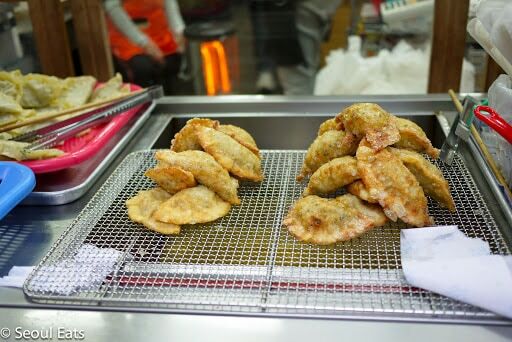 Dumpling lovers, rejoice — Bukchon Son Mandu will be at the top of your list of favorite Seoul restaurants by the time your trip is complete. Whether you’re a sucker for the steamed or fried variety, Bukchon Son Mandu has a reputation around Seoul for bringing a dumpling game to the table that’s hard to beat. From the perfectly seasoned filling to the sauces that come on the side for your dipping pleasure, a meal at Bukchon Son Mandu will leave you satisfied and craving more delicious dumplings both at the same time. Make sure you round out your lunch order with a bowl of buckwheat noodles — the flavor contrast is amazing! While fried chicken may not immediately come to mind when you think of Seoul, you should venture down to Hanchu if you need a quick meal during your trip for an otherworldly fried chicken experience. Wildly popular, Hanchu has minimal decor as you walk in, which helps convey that they’re serious about their fried chicken craft — they get down to business right away. 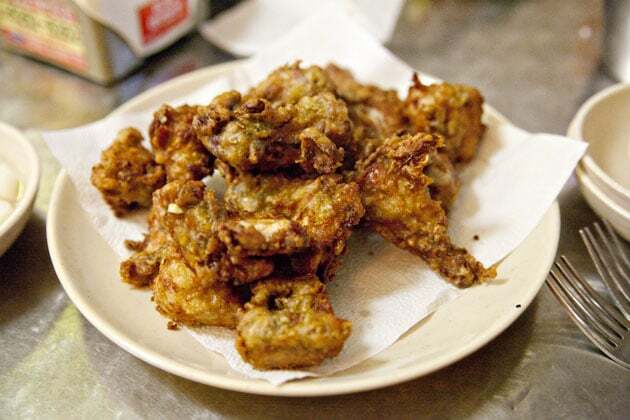 Their fried chicken recipe calls for grated chili in the batter itself, so there is a slight inherent spiciness that will keep you coming back for more. The chicken itself is perfectly cooked with an every-so-slightly greasy but very crunchy exterior. Whether you’re looking to pick up a fried chicken meal to go so you can get on enjoying your exploration of Seoul or you want to chat with new friends over a chilled beer and some fried chicken, Hanku should definitely be on your list of Seoul restaurants to check out! If you’re on the adventurous side and you’re a fan of Korean barbecue, consider visiting Doramu during your stay in Seoul. Doramu has a very interesting approach to barbecue — it’s definitely Korean barbecue, but there is also a Mexican influence that makes their menu a unique one in Seoul currently. At Doramu you’ll find all of the usual suspects at a Korean barbecue restaurant — namely, variations of deliciously seasoned and prepared meats, especially pork — but the presentation and flavor combinations are fun and inspired. 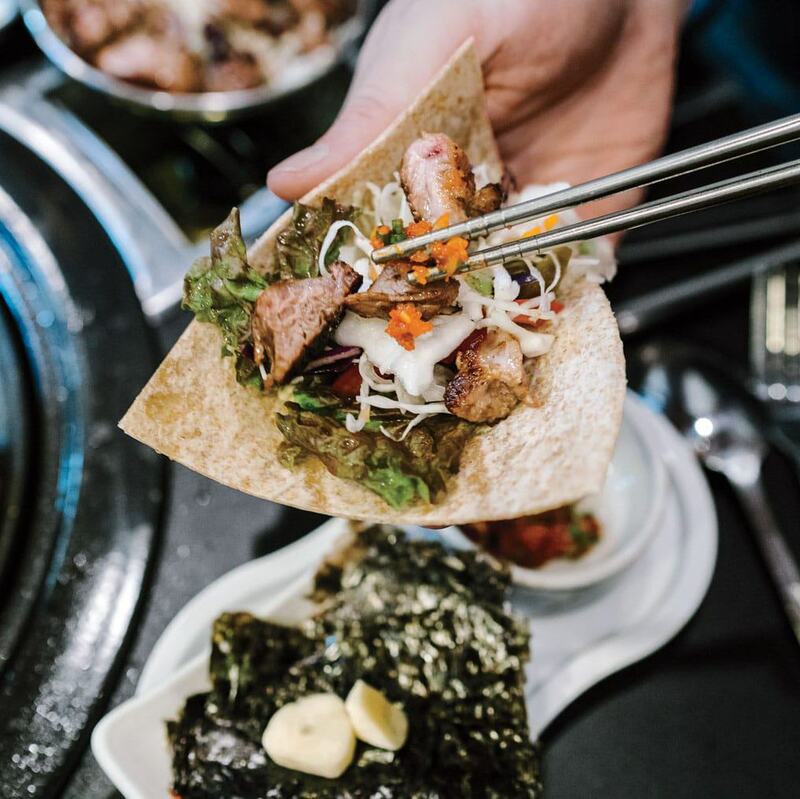 Rather than the presentation you’d find at any run of the mill Korean barbecue restaurant, your pork will be served atop a tortilla for you to wrap it in, or if you’d prefer, a bit of seaweed. The name of their game is to surprise and delight, and they do just that! Doramu doesn’t stop with barbecued beef and pork. No meal there is complete without complementing your meat selections with doenjang jjigae or a cold bowl of noodles to provide you some relief from the heat of the barbecue — the intense flavor is not for the faint of heart! Although you’ll surely want to venture out to try different types of exciting and cutting edge street food and restaurants while you’re in Seoul, you should make an effort to stop by Hadongkwan for an unbeatable and authentic Korean meal while you’re in Seoul. 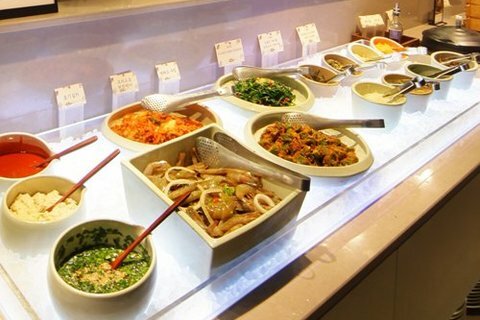 Speaking to Seoul residents, there are plenty of opinions as far as which restaurant serves the best Korean food in Seoul. While there are plenty of good Korean restaurants, Hadongkwan is loved by so many because the restaurant is a tradition that celebrates the best parts of Korean cuisine (and does an amazing job doing so). Hadongkwan originally opened over seventy years ago, and while much of the restaurant’s menu and decor has changed (as well as the location itself), it remains a place where you can go to experience consistently wonderful Korean food. 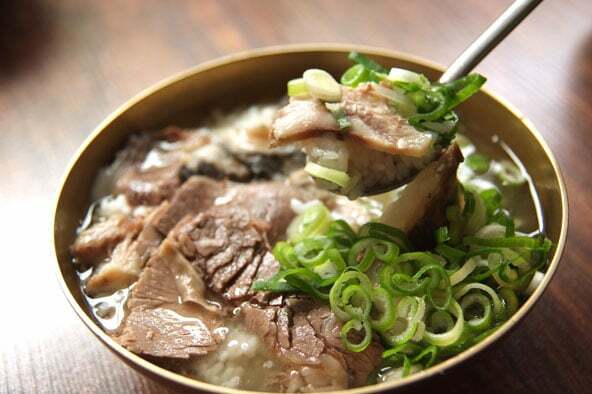 Make sure you try the dish they are best known for, a beef and rice soup called gomtang — it will be the perfect meal to round out a day full of adventure when you’re feeling a bit low on energy, because it’s meant to be eaten during periods of tiredness. Visit Hadongkwan and you’ll quickly realize why the restaurant has remained open for seven decades! With traveling comes long days exploring new cities and meeting new people, and on especially tired days you’re bound to be starving at the end of the day. Fear not — Hansik Olbaan has got you covered. Hansik Olbaan is a buffet restaurant that features classic Korean dishes that can be found in most restaurants in Seoul. That being said, it’s so popular due to its use of fresh seasonal ingredients that transform each home-style dish into something elevated. Whether you’re looking for barbecue, noodles, or Korean ice cream sandwiches, Hansik Olbaan is a mecca that will make sure you leave satisfied — perhaps too satisfied. It’s easy to go overboard at a buffet with a spread like this one, so make sure you pace yourself. You should also probably break out the pants with the elastic waistband you were smart enough to pack for your trip! Do you have a favorite Seoul restaurant that you think is essential to visit? Let us know in the comments below!